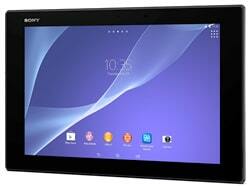 The Sony Xperia Z2 Tablet is a 10.1-inch Android device with NFC. The tablet, an upgrade of 2013’s Xperia Tablet Z, runs Android 4.4 KitKat and is powered by a 2.3GHz quad-core Qualcomm Snapdragon 801. Billed by Sony as “The world’s slimmest and lightest waterproof tablet,” the device is just 6.4mm thick and weighs less than 440g.